#NephMadness season is here! The #TransplantRegion has very interesting matchups, but one player that was left out of this contest because is relatively new in the game and relatively unknown, is Mesenchymal Stem Cells (MSCs). In the last few years the transplantation field has struggled to find how to prolong graft survival by inducing tolerance, minimize immunosuppression, inhibit fibrosis and treat rejection episodes. A candidate with all these characteristics are MSCs. MSCs are mesoderm-derived multipotent stromal cells that have high self-renewal and multi-lineage differentiation potential, anti-inflammatory properties, effects in the innate and adaptive immunity and the ability to repair damaged tissue. But what exactly makes MSCs attractive to transplantation? First of all, their effectiveness has been reported in the treatment of graft-versus-host-disease (GVHD). MSCs are found in fat, bone, cartilage, umbilical cord, cord blood, synovium, synovial fluid, muscle, skin and pulp and they can also be isolated from those organs, including the kidneys, which could be of major interest due to its repairing properties. 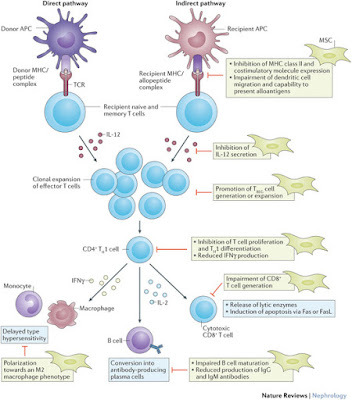 MSCs inhibit T cell proliferation via several mechanisms including indoleamine 2,3 -dioxygenase (IDO) activity, production of prostaglandin E2 and transforming growth factor (TGF-β), expression of low levels of major histocompatibility complex (MHC) class II and costimulatory molecules including B7-1 (CD80), B7-2 (CD86) and CD40. They also inhibit macrophages, NK cell proliferation by reducing IFN-γ and dendritic cells (DCs) activity. In experiments, MSCs affect the ability of DCs to prime T cells in vivo. They also have direct effects on the endothelium by enhancing angiogenesis via expression of vascular endothelial growth factor (VEGF) and angiopoietins. The available data on B cells has not been studied extensively but some experiments report that MSCs increase CD4+, CD25+ and FoxP3+ regulatory T cell function (Treg) which may cause arrest of B lymphocytes in the Go-G1 phase of the cell cycle. In addition, MSCs by mediating T cells, inhibit the maturation, migration, proliferation and antibody production of B cells. Remember that FoxP3+ expression has an important role on Tregs. You can check details here in the #NephMadness Transplant Nephrology Science Region (#TransplantRegion). Although all these properties are exciting there are more questions than answers. In mouse models of GVHD, MSCs were administered at 3, 8 or 20 days after bone marrow transplantation and other reports have suggested that a better immune suppression can be achieved when they are administered before transplantation, so clearly, there is no evidence for timing of administration. In regards to dosing and frequency, the MSCs proposed dose is 0.4 - 10 x 106 cells per kilogram of body weight in humans but using a high dose has also been reported. The frequency of administration has not been determined. There are no reports on adverse events related to the infusion itself and long-term effects are not available, however in vitro and in vivo studies have shown that MSCs have the potential to differentiate into neoplastic cells and may promote growth of tumor cells. In this report with autologous MSCs as induction therapy into living-related kidney transplant recipients, 159 patients were randomized to receive MSCs induction therapy with standard calcineurin inhibitor (CNI), MSCs induction with low-dose CNI or interleukin-2 (IL-2) receptor blocker. The authors reported reduced opportunistic infections in comparison to controls (HR, 0.42; 95% CI, 0.20-0.85; P = .02 ). Rejection episodes with MSCs induction were 8%, compared to 21% in the IL-2 receptor blocker group. As of today (March, 2016), to my knowledge, there are 13 registered trials of MSCs in kidney transplantation that are currently recruiting patients or have been completed on the clinicaltrials.gov website. Other areas of interest in which MSCs are being used are acute kidney injury, chronic kidney disease and polycystic kidney disease. Most studies have used autologous MSCs since they seem to be more potent than allogeneic MSCs but it requires a long process and time can be an issue if recipients are in need of treatment for rejection. One advantage of allogeneic MSCs is that they can be available rapidly. In conclusion, I think Tregs would have been a strong competitor in this year’s #NephMadness if MSCs would have qualified. Maybe next year or in the next few years they will be in better shape to compete in #NephMadness. 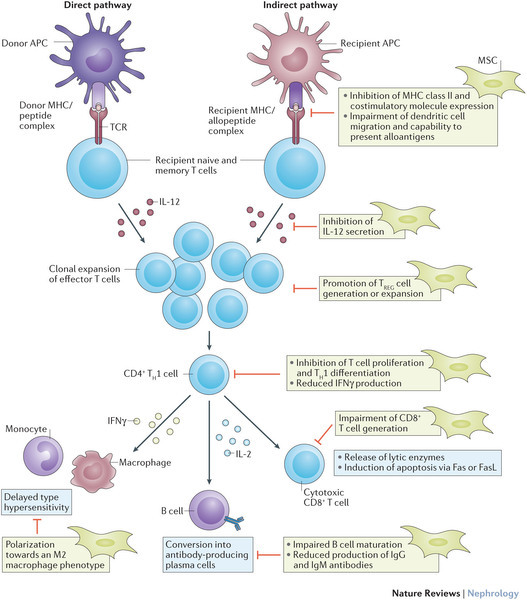 MSCs may have a very important role in kidney transplantation given their immunosuppressive, reparative properties and potential to induce tolerance, however there are several technical aspects that are complex such as isolation, culture, amplification and cost, plus long-term outcomes are unclear at the moment and large clinical trials are needed. Don’t forget to fill out your brackets! Image from: Mesenchymal stromal cells in renal transplantation: opportunities and challenges. Nature, Feb 2016. 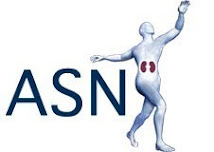 A small absolute change in serum creatinine level, 0.3 mg/dl, is used by Acute Kidney Injury Network (AKIN) and Kidney Disease Improving Global Outcomes (KDIGO) guidelines to define the presence of Acute Kidney Injury (AKI). The base of this definition was formed by several studies findings of strong association between adverse outcomes and minor changes in serum creatinine level. Subsequently, evidence emerged suggesting that this may not be true to the same extent in people with pre-existing CKD, because variations in serum creatinine concentration are common in these individuals. As with all other laboratory tests, serum creatinine measurements are affected by within- and between-sample coefficients of variation, intra-individual variation and biologic variation. Biological variation may result from variations in diet, muscle mass and breakdown, tubular secretion, variability in volume homeostasis and from medications uses. The variation in measured serum creatinine level could be as high as 9%. Because only a small increase in serum creatinine is needed to meet AKI criteria, random variation in creatinine level may be a significant contributor to AKI diagnosis in the absence of a true reduction in GFR. This is called a false-positive AKI. It has been shown that high variation in serum creatinine in the period, of days, preceding the development of AKI was not associated with the anticipated inpatient mortality or dialysis. This observation supports the existence of false-positive AKI. Lin et al demonstrated, using the KDIGO definition, an 8% overall false-positive rate for AKI diagnosis. This rate was much higher, 31%, for the subgroup of CKD patients with serum creatinine ≥1.5 mg/dl. Therefore, an absolute change in serum creatinine of 0.3 mg/dl may represent a relative inconsequential change in GFR in CKD patients rather than a superimposed acute injury. In my opinion, false-positive AKI could largely explain why most randomized trials for early intervention in AKI have been unsuccessful in improving outcomes. AKI is misclassified under frameworks that do not reflect true GFR reduction. Consequently, patients with false-positive AKI are included in AKI studies and dilute observed effect sizes. This potentially leads to false-conclusions that certain interventions are ineffective and do not improve outcomes. The underlying severe disease is quite likely the actual mediator of adverse outcomes seen in AKI. Therefore, small changes in serum creatinine may be nothing more than a reflection of the severity of the underlying disease process. This point remains a topic of hot debate. Moreover, AKI definition using small increments in serum creatinine level has not been validated among patients with CKD. It is obvious now that serum creatinine is an imperfect AKI biomarker; especially that it is being used on the basis of a relative change in value of a continuous variable instead of the crossing of a particular threshold. The ideal biomarker would accurately detect true reduction in GFR, be detectable early in the course of renal dysfunction to allow for timely intervention, and predict outcomes. It is likely that current AKI criteria will eventually be modified at least in part by sensitive and specific biomarkers of kidney injury. The use of such biomarkers will help in the development of a new paradigm for classifying AKI that is not only dependent upon serum creatinine. Meanwhile, the awareness about false-positive AKI should be highlighted and the limitations of serum creatinine, as an AKI biomarker, should be re-emphasized. NSMC intern and Pulm Critical Care Attending Kamran Boka produced a great info graphic on the pathophysiology of ecstacy induced kidney injury which has a first round matchup against cocaine toxicity in NephMadness 2016. Check out the entire scouting report for the Recreational Drugs and the Kidney Region. 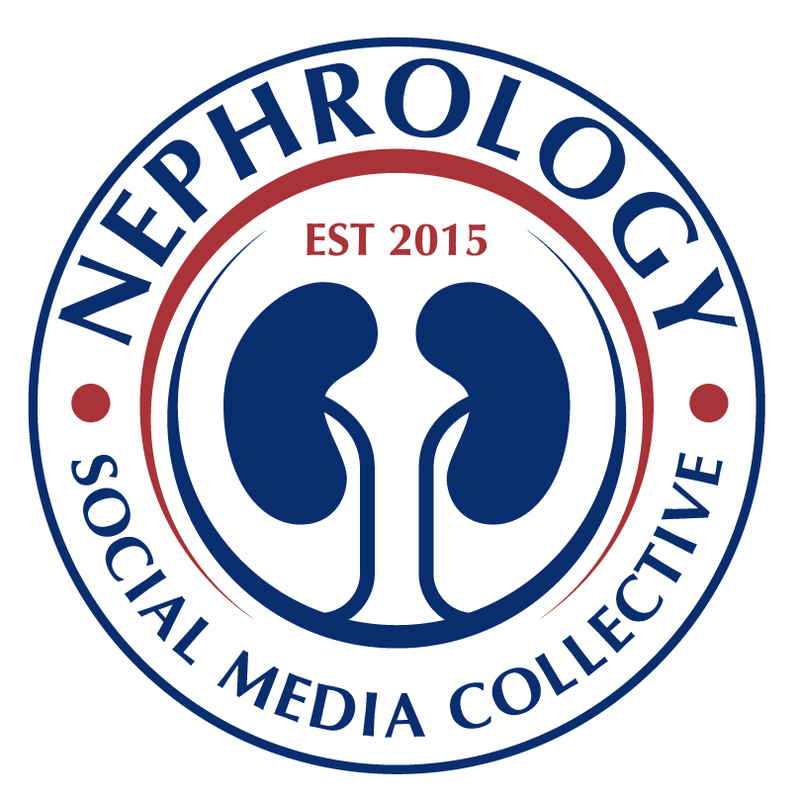 It’s finally arrived, the fourth annual NephMadness has dropped with 32 new Nephrology concepts battling it out for the month of March to see who will be crowned champion. Fully referenced blog posts on each of the topics are available at AJKD Blog and an explanation of the event can be found here for our new participants. Essentially, it involves reading up on the content provided and deciding which Nephrology concepts win in head to head, knockout match-play. You may fill out your bracket (pick your winners) using our online tournament page until March 23rd. I’m hoping this year the winning participant will be a fellow/resident (or SpR/SHO) or better still a group of trainees. Last year there was a trend towards fellowship programs coming together, debating the topics and matchups and making their picks as a team. This is a fantastic way to extend the free online medical content to real-world flipped classroom teaching sessions at your institution. I’d also love to see this extend outside of the US to SpR training programs in Europe, Asia and beyond. So I propose you enter the contest individually but also with your colleagues as a group. Eternal glory awaits! Positron emission tomography (PET) is a nuclear imaging modality that provides functional imaging of structures based on their ability to metabolize glucose and concentrate specific molecules that have been labeled with a positron-emitting radionuclide. Metabolically active cells (e.g, malignant or inflammatory) utilize and import more glucose than other tissues and, thus, take up 18F-fluorodeoxyglucose (18F-FDG) more avidly. Integrated PET/CT is preferred, because it allows for more exact anatomic localization of isotope uptake and more accurate staging of cancers. PET is escaping oncology however and starting to find a role in nephrology. In post-transplant lymphproliferative disorders, integrated PET/CT is used as a measure of disease activity. It has also been reported to differentiate fat-poor angiomyolipomas from renal cell carcinoma with 94% sensitivity and 98% specificity. Integrated PET/CT scanning may also be of utility in differentiating benign versus malignant fractures and highlighting impending ones in patients with multiple myeloma. What about APKD? Cyst infection is common and may be difficult to diagnose in the presence of sterile urine. Bobot et al compared PET-CT to CT and MRI for a diagnosis of cyst infection. Cyst wall hypermetabolism was considered as a positive PET-CT result. A diagnosis of cyst infection was made in 18 of 32 cases: 14 with positive PET-CT findings, and 4 false negatives. There were no false positives and no hypermetabolism of cyst walls in 9 ADPKD control patients. PET-CT had a sensitivity of 77%, a specificity of 100%, and a negative predictive value of 77% compared to CT alone which had a sensitivity of 7% and a negative predictive value of 35%. Radiation doses were comparable and injection of nephrotoxic contrast was avoided in the former. Similarly PET-CT may be useful the detection of vasculitis in the large arteries with 29/35 patients with known giant cell arthritis showing active arterial inflammation (sensitivity >80%) . Patients suffering from granulomatosis polyangiitis (GPA) show marked aortic FDG uptake although it is unclear whether this is indicative of atherosclerosis or large vessel involvement. If it is indeed the latter this calls into question the traditional classification of vasculitis. FDG-PET/CT accurately identified organ localizations in 16 patients with GPA, other than in nervous system, eye and skin, but may not bring additional benefit to the usual organ screening. Retroperitoneal fibrosis is a rare fibro-inflammatory disorder that is most commonly idiopathic (>75%) and part of the IgG4-disease related spectrum. 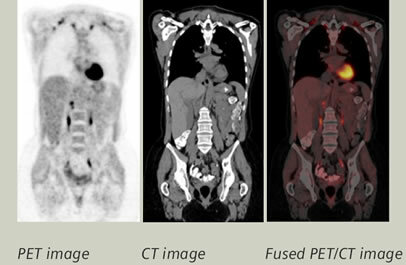 PET-CT has emerged as a useful tool for the assessment of disease activity and also detects any post-treatment residual disease. It may lead to early diagnosis of relapses and may also detect diseased sites other than the peri-aortoiliac tissue. 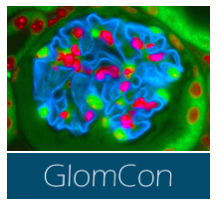 Could PET imaging have a role in the detection of occult malignancy, inflammation or infection in secondary glomerulonephritis? If we extrapolate from studies involving venous thromboembolism (VTE), a prospective cohort of 99 patients with a first episode of VTE reported occult cancer identified by PET/CT in 23% of cases with a sensitivity and negative predictive value of 77% and 97% respectively. However this sensitivity is still too low to justify its use as a widespread screening tool in this capacity as nearly 1/4 cancers may be missed. Patients with ESRD undergoing maintenance hemodialysis are highly susceptible to infections. Of 104 study patients, 73 (70.2%) had positive 18F-FDG PET/CT findings, and a total of 95 major infection foci were identified. 7 (53.8%) of the 13 patients with primary vascular access-related infections had concurrent metastatic foci. 28 patients (26.9%) had their treatments modified by PET/CT results. In this population, positive PET/CT findings led to a significant change in clinical management and independently predicted mortality. PET/CT may also help non-invasively prevent avoidable transplant biopsies in kidney transplant recipients with suspected antibody-mediated rejection. In 31 transplant recipients, PET/CT was performed in those who underwent biopsy with a positive correlation between mean SUV and acute composite Banff score (r2 =0.49). The area under the receiver operating characteristic curve was 0.93, with 100% sensitivity and 50% specificity using a mean SUV threshold of 1.6. But are there any side-effects or limitations to use of PET-CT in our patients? For example, use of IV contrast may be precluded in certain cases of renal impairment and this may impair the optimal detection of small lung and liver lesions. IV contrast increases lesion conspicuity, which is of particular importance in the evaluation of lesions that do not always accumulate FDG. However use of PET-CT without IV contrast has become more widespread and differentiation of benign from malignant lesions is less relevant in Nephrology. The whole-body FDG distribution in patients on hemodialysis may be different from those with normal renal function, because they lack urinary FDG excretion and remain in a constant volume overload. There may be significantly higher physiological FDG uptake in the soft tissues, spleen and blood pool. In conclusion, I believe that combined PET-CT imaging has the potential to be a very useful and versatile tool for Nephrologists. Whether we are dealing with metastatic infections, occult malignancy, suspicious GN or vasculitic relapses, it may be a revealing diagnostic test at times when our concern exceeds the objective evidence that we have to hand. That said, it is not without cost or risk, and therefore should only be employed judiciously when likely to change clinical management. Another great episode of the Wash U Renal Pathology Teaching Series from Timothy Yao.